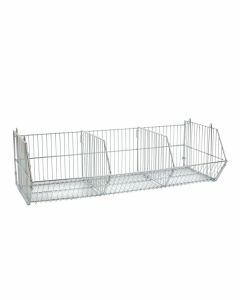 Wire stacking baskets are an excellent way to display packets of items that will not sit properly on a shelf but do not have a feature that allow you to hang them on hooks. These baskets can sit alone on top of a shelf or can be stacked on the floor to create their own stand. Our range of stacking baskets come in 4 different widths to ensure you can find the perfect fit for your store. At Shelving4shops we aim to source affordable and durable shelving units in variety of sizes. If you are unsure what is the best option for you our friendly advisors are on hand to ensure that you get the most cost-effective and efficient way to organise your shop shelving.